Australia 3-150 (David Warner 62, Ed Cowans 36, Angelo Mathews 1-9) trails Sri Lanka 156 (Kumar Sangakkara 58, Prasanna Jayawardene 24, Mitchell Johnson 4-63) by six runs. The Australian bowlers led by Mitchell Johnson destroyed the batting line up of Sri Lanka in their first innings as the home batsmen were cruising nicely. Sri Lanka was bowled out for 156 mere runs in their first innings and Australia replied strongly by scoring 150 runs for the loss of just three wickets in 39 overs. 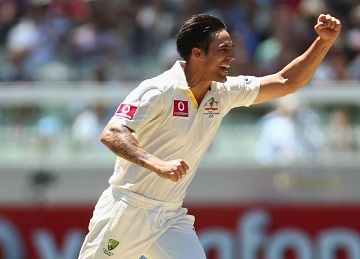 The second Test of the three match series commenced on Wednesday, December 26, 2012, at Melbourne Cricket Ground. Earlier, Mahela Jayawardene, the captain of Sri Lanka, won the toss and elected to bat first. They had an awful start by losing their openers, Dimuth Karunaratne and Tillakaratne Dilshan for 5 and 11 runs respectively. Kumar Sangakkara and Mahela Jayawardene got together in the centre and tried to stabilise the innings. Sangakkara required 40 more runs to join the 10,000 club in Test cricket and he flew off nicely by hitting two back to back fours in the 9th over. Jayawardene was playing a subdued innings and scored just three runs off the first 24 balls he faced. He was caught behind by the wicketkeeper Matthew Wade off Peter Siddle in the next over for three runs and the third wicket was gone at 37 runs. Sangakkara was playing an anchor’s role with a little assistance from the middle order batsmen. Thilan Samaraweera was the next batsman in but he too, preferred to defend as Sangakarra dispatched three consecutive fours in the 21st over bowled by Mitchell Johnson. Kumar Sangakkara achieved the 10,000 runs milestone in Test cricket by hitting a four on the second ball of the 25th over. He became the only second Sri Lankan batsman to attain that magical figure in the longest version of the game after Mahela Jayawardene who has smashed 10674 runs. The fourth wicket association took the score to 79 when Samaraweera was gone for 10 as Angelo Mathews replaced him and scored nine runs in the 27th over. The latter became the next victim after contributing 15 runs as Prasanna Jayawardene appeared in the centre. Kumar Sangakkara scored his 41st Test fifty on the third ball of the 35th over as Prasanna Jayawardene lost his wicket for 24 runs. Sangakkara was the 8th batsmen who went back to the pavilion for 58 off 98 balls with 8 fours. The Islanders managed just 156 runs in their first innings after utilising 43.4 overs. 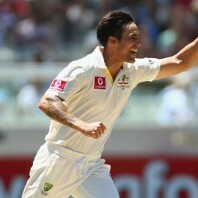 Mitchell Johnson became the 14th Australian bowler to grab 200 Test wickets by clinching four in the innings whereas the debutant Jackson Bird, Peter Siddle and Nathan Lyon shared two wickets each. The Kangaroos opened their innings with Ed Cowan and David Warner in a confident manner by scoring 27 runs in the first seven overs. Warner added 14 runs in the next over with 3 fours as Cowan hit two in the following couple of overs. Warner hit the first six of the day on the second ball of the12th over and reached his fourth Test fifty on the next ball. 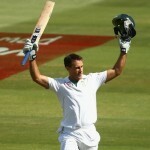 The partnership kept running and the duo added 12 runs in the 15th over with one four each from the two batsmen. The first wicket association blasted 95 runs in just 17.3 overs when David Warner was caught by Dhammika Prasad off Angelo Mathews for 62 off just 46 deliveries with 1 six and 6 fours. The next wicket fell at 117 runs when Phillip Hughes was run out for 10 runs and Ed Cowans was caught by Mahela Jayawardene in the second slip off Prasad for 36. The third wicket was lost at 117 runs as well when the Australian skipper, Michael Clarke and Shane Watson joined together at the crease. Clarke was dropped by Dilshan at silly mid-on at the bowling of Rangana Herath when the the batsman had scored five runs. 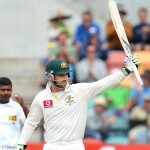 The sloppy fielding of the visitors continued when Shane Watson was dropped by the wicketkeeper Kumar Sangakkara off Chanaka Welegedara at just eight runs. The pair survived until the end of the day as Australia thrashed 150 runs after 39 overs with seven wickets in hand, Clarke and Watson were batting at 20 and 13 runs respectively. 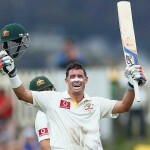 Australia is in a commanding position as they are short of just six runs from the first innings total of Sri Lanka. The hosts are in sight of a sizeable lead with two set batsmen at the crease and a plenty of batting still to come.